All restaurants have a web presence: locations on Google Maps, reviews on TripAdvisor and check-ins on Foursquare. Some restaurants even have their own web site, for what it’s worth. Restaurant web sites are awful, perhaps because there’s rarely budget for more than a glamorous brochure. You’ll be lucky if the mostly-useless content includes more than an address, phone number, a few photos and a menu. Most of this content isn’t a problem because it doesn’t change, though; the problem is the menu. A restaurant’s menu might change from week to week, but restaurant web sites are not usually designed for editable content. In practice, the web site probably only has a ‘sample menu’. Cafés sometimes make good use of a Facebook page, posting updated menus and photos of daily specials, but this is awkward at best. Web sites for ordering online, such as JUST EAT, are an important exception. This kind of service has a platform for up-to-date menus, but only for takeaway food. Also, you still have to start by choosing a restaurant, before you can browse the dishes on offer. Online music retail shows that the CD album was largely a distribution channel convenience, and that people buy single tracks if they can, to get the sings they want and to avoid buying tracks that aren’t as good. This is especially relevant for classical music, with many recordings of one piece of music, each with its own interpretation. Restaurant food is like classical music. In the same way that you might decide which symphony you want to listen to before you choose an orchestra, you might know what you want to eat before you know where. What’s missing online is web site that let’s you search your town for pizza with prosciutto and rocket, stake and ale pie, or Pad Thai with prawns. You need One Big Menu. Once you can search by dish as well as browsing by restaurant, you realise that reviews should be per-dish instead of per-restaurant. If you’re looking for perfect risotto then you don’t care how pizza-eaters rate the restaurant. Moreover, consistency across dishes is a good indicator of all-round quality. Most importantly, a service that focuses on dishes can make it easy enough for restaurants to update their listed dishes from day to day. 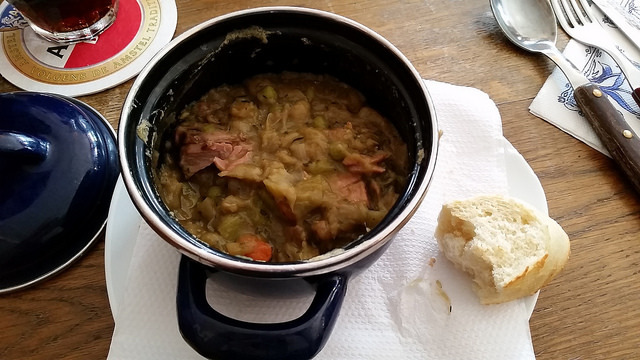 In the Netherlands, for example, pea soup (photo) is a seasonal dish that’s only made after the first frost, so it only ever appears on the specials board. Making it easy for restaurants to update dishes online would make it possible to actually find the daily specials. One Big Menu enables an ultra-simple mobile app that detects your location, knows your favourite dishes and friends’ recommendations, and tells you what to order. No more struggling to choose between too many options. After all, people complain about other people using smartphones in restaurants, but having to look at the menu is a far bigger interruption to a good conversation. Another benefit to the One Big Menu mobile app are language localisations, so that you don’t have to struggle with a menu in a language that you don’t read. Restaurants don’t even have to provide their own translations, because for such a constrained vocabulary, automatic and crowd-sourced translations are highly-effective. In particular, this helps restaurants avoid having touristy-looking multilingual menus with embarrassing mistranslations. The successful One Big Menu platform also makes additional services possible. Templates for restaurants to print menus. Partnerships with printer shops to produce high-quality menus - moo.com for menus. White-labelled restaurant pages that allow custom-designed restaurant web sites - a hosted restaurant web site content management system, like HappyTables. Spin-off platform for tracking guest beers, so you can choose a pub for the beer instead of the people. Promotional opportunities from gamification - become your town’s resident cheesecake expert. As for business model, the first step is to build a user base and develop a revenue model later. What could possibly go wrong?